San Francisco Giants centerfielder Denard Span (2) watches as Johnny Cueto pitches to Baltimore Orioles shortstop Manny Machado on Sunday, August 14, 2016 at AT&T Park in San Francisco, Ca. 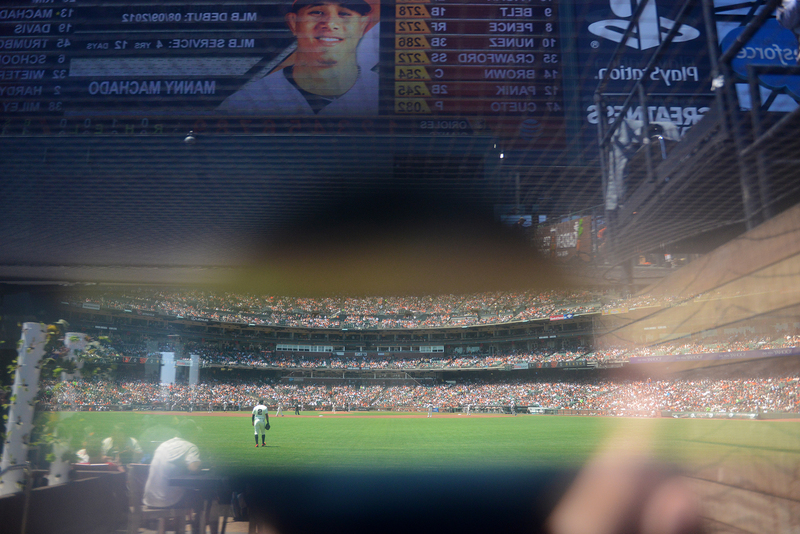 The garden, in centerfield in AT&T park, offers restricted views to the playing field through slots in the outfield wall, which also reflect the scoreboard directly behind it. The Orioles overcame a 7-1 deficit to stun the Giants with an 8-7 victory on a go-ahead three-run home run by Jonathan Schoop with 2 outs in the top of the 9th inning. Photo by David Andrews.